We never know where our lives are going to take us! Particularly for our service members and their families! Yep, we never knew when the next orders were going to arrive and where we would be heading till the last possible moment it seemed (we had a couple of PCS orders that arrived within 2 weeks of report date for the next assignment). Growing up I had enjoyed seeing airplanes but this northern Indiana farm and steel worker family's kid had no idea he would be in the Air Force flying aircraft for 30 years defending this wonderful country. So I was enjoying life with a bit more of a "settled" feeling after that last PCS a few years back and staying in one place for more than 2-3 years. Then came an almost desperate call from a doctor in June. "We need to see right now" did not sound good. I had had an ongoing problem with a sore on my foot and the doctor had finally decided to do an MRI and it came back with a possible diagnosis of sarcoma, a soft tissue cancer. The doctor scheduled me for surgery within 4 days and did a biopsy and removed most of the tumor and sent the specimen to pathology for an official analysis. When the local pathology department said we do not recognize and sent it to the University of Michigan for further analysis I should have known but still thought, can't be, not me, just a healthy guy! It came back positive for cancer (myoepithelioma to be exact) a week later and kicked off a series of doctor appointments. The first oncologist in Grand Rapids asked me how long I had this lump in my upper thigh? Not sure doc, never noticed it. She asked for a special test called a PET CT to look all over my body for potential cancer and unfortunately it confirmed the cancer had spread to my lymph nodes. The first surgeon referred me to a specialist for orthopedic surgery and our first appointment was our last. He said I know nothing about this cancer but I think you should, "tough it up soldier and let them take off the leg". I almost threw up on him and thought my patient advocate was going to physically assault him. (My patient advocate was my wonderful wife, Deborah who has been at every appointment since this started!) While we did not appreciate his "bedside manner or patient style" he did refer us to a wonderful doctor at the University of Michigan. Ranked in the country for her specialty Dr Biermann was top notch and brought a great team together! After mutltiple appointments at U of M we were finally scheduled for surgery on August 17th. The team was impressive! Three surgeons, one to remove the lymph nodes in my upper leg/groin, one to remove a large chunk of my heel and a third to repair the heel. I was scheduled for surgery for 6 hours and stayed in the hospital for 5 days afterwards but I get ahead of myself. During pre-op the staff was preparing me for an epidural block in my back in addition to the general anesthesia that would knock me out! I asked why I needed both and they explained they would use it to control pain after the surgery by directly administering pain medication there. During this process I passed out due to my very slow heart rate and low blood pressure from being a very active person and I imagine a bit of stress. I remember waking to the words of a comforting Dr Green as she talked to me back to consciousness. She had Deb paged and we talked for a while before I began pre op procedures again. By the way Dr Green proudly told Deb and I that she was a military brat! She spoke kindly and told Deb to find some food and then spend some time in the chapel for her soul too! We had explained our faith to her during our talk and she was wonderful. If you have read the book, "The Shack" she fit the character of "God" exactly. We still smile today about this time. Surgery was long but fortunately only 4.5 hours not 6 and not as extensive on the heel as they thought might be possible. During my hospital stay I learned how to use a walker, get in and out of a car (they actually had a mockup) and many other useful tools for recovery. I received a temporary handicap sticker (never thought I would need one of those) and released to begin the new normal. It has been 6 weeks since surgery. I still need pain medications occasionally for my foot but the lymph node area is healed completely except for some expected swelling. I am trying to walk again but limited due to the discomfort while it closes the open wound left after the surgery. I tried to get back to work on MilitaryAvenue.com right away but the family laughed at me as I made a lot of mistakes and had a number humorous moments in the haze of pain meds. Did I tell you I had hallucinations in the hospital or that Deb had to remove a hot cup of coffee from my hand after I fell asleep in between raising it from the table and placing it to my mouth? Another moment of hilarity for the family was starting a sentence, phrase and stopping to sleep and then continuing that thought moments later! Quite the skill! We continue to visit doctors at U of M (which is more than 2 hours away in good weather and I learned to control pain while bouncing in the car on these smooth Michigan roadways with a pillow for my foot) and I am getting more comfortable every day. So why did I write this epistle? First, I think it helps me understand what happened to me! Second, it gives me a chance to tell others that I am ok! Third, my faith has held me up and God is in charge! Actually, that last one is probably first! Of course, I appreciate the wonderful care I have received from my wonderful bride, the medical teams, visiting nurses and therapists! I look forward to being completely healed but life changed on that day in June! Photo Credit: The author with aunts and uncle and cousin during a 1953 wedding. 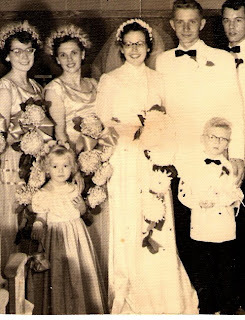 That adorable ring bearer in the wedding picture retired as a colonel in the USAF and won the hearts and allegiance of folks throughout the world... and especially the hearts of his family. So proud of Col K! Keep the epistles coming!